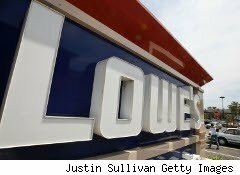 A virtual Black Friday stampede of bargain hunters overwhelmed Lowe's web site early this morning when the home-improvement retailer kicked off its holiday shopping sneak peek on Facebook. The social media promotion started one minute after midnight Friday and featured videos with a limited number of coupon codes that could be used online for as much as 90% off some merchandise. Comments from shoppers on Lowe's Facebook page talked about how users put the items in their shopping carts, started the checkout process using the coupon codes -- and got the discount -- but when the site crashed, their shopping carts reset -- either at the original price or were cleared. In some cases, the user appeared to still have the discount, but it was gone after the checkout was complete. "Fans, the response to our promotion last night was greater than we expected. Despite preparations, we were unable to support the overwhelming traffic. We're committed to satisfying our customers and our Facebook fans, and will be offering additional quantities of coupon codes to more customers. These deals will be distributed sporadically throughout the weekend to prevent the issues that occurred last night." Lowe's said the coupon codes will be posted starting Saturday (Nov. 6) because as of early this evening the site was still experiencing technical difficulties. Lowe's spokeswoman Colleen Carbott said the retailer is looking into exactly what happened -- the site was tested the night before the promotion. "We apologize," Carbott told Consumer Ally. "We know that our fans are disappointed right now." Even with the site crashing, about a thousand people were able to use the coupon codes for two items, she said. The number of consumers who tried to get on the site when the event started was not available, but almost 100,000 people indicated they were planning to attend the virtual event on Facebook. Carbott said that by staggering the release of codes throughout the weekend, the retail site should be able to handle the traffic.